← The Space Between . . . When taking pictures I’m often drawn to the razor’s edge: a contrast in color so stark that it seems improbable, as if rendered in a Warhol print. A light rain plinked on us as I walked with my children towards the train station in Droghedah, about midway between Belfast and Dublin. 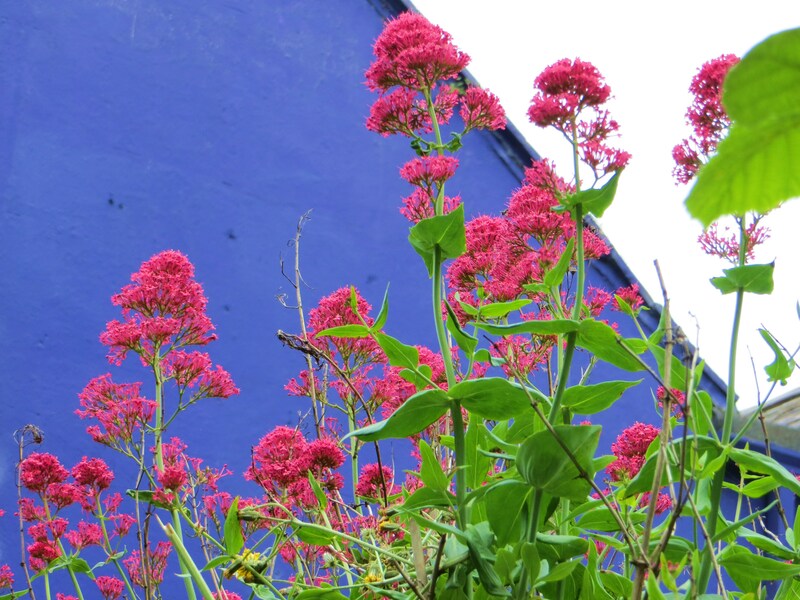 We had just crossed an old stone bridge when I glanced over my left shoulder at a burst of bright color and saw these magenta flowers, which neighbored a brilliant violet-painted house. Life is not short on contrasts so jarring as to occasionally instill disbelief: hope and resignation, birth and death, love and hate, kindness and indifference, darkness and light. On another June 28th, not so very long ago, I walked into a hospital on an oppressively humid day, hand-in-hand with my outwardly healthy young husband Jim. When we entered that space we had consuming jobs, children excitedly heading off to different places, and a wedding anniversary a few weeks away. When we walked out of the hospital later the same summer day it was still light, and suddenly Jim was a full-time cancer patient and I a crushed, unready and unsteady caregiver. And we both knew–though he did his best to spare me the devastating certainty of the diagnosis he had just received–that he was dying. It seems to me that the essence of living with grief is about wearing away the razor’s edge, smoothing the contrast between acceptance and defeat, before and after, then and now, so the pain doesn’t disappear, but softens its way into memory, eliding into a nostalgia that preserves love and helps one find peace. This entry was posted in Love and Loss and tagged Andy Warhol, diagnosis, Drogheda, grief, Ireland, postaday, Weekly Photo Challenge: Contrasts. Bookmark the permalink. Your final paragraph is heartbreakingly beautiful. It not easy to find peace in between the edge contrasts…. The last one expresses so very well. Beautiful post, both in photographic and written imagery.